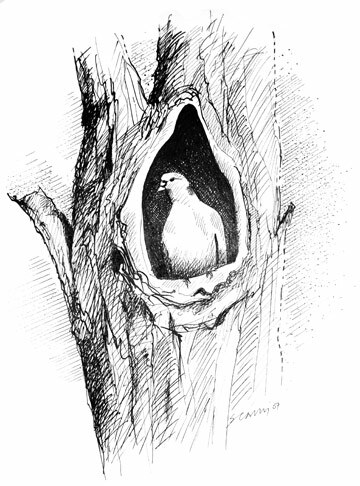 The distribution of Stock Doves has changed little in twenty years. As in our First Atlas, they are widely spread across the county, with the gains and losses almost balancing out and no coherent pattern except perhaps for the cluster of eight newly occupied tetrads in SJ69. In some areas they could have been under-recorded, some birdwatchers having a blind spot for pigeons and not recognising their far-carrying excited ‘coo-oo-up’ calls. They avoid most urban areas, with gaps around east Wirral, Chester, Widnes, Warrington, Northwich, Congleton and Macclesfield visible on the distribution map. This also shows in the habitat records, with only 6% of codes from human sites, mostly in rural areas, and 54% in farmland, 36% in woodland and 3% in scrub. This is primarily a bird of parkland, the edges of woods and farmland with copses and hedgerow trees. Their diet of farmland seeds, leaves and buds, meant that they were badly hit in the 1950s and early 1960s by the poisonous organochlorine seed-dressings, but, following the ban on their use, Stock Dove numbers bounced back. Their stable distribution in the county might suggest that their population has levelled out between our two Atlases, and the BTO figures show the national index to be just 16% higher than in 1984. Grazing farmland has deteriorated as a breeding habitat for Stock Doves in recent years, however (Siriwardena et al 2000). According to the analysis of BBS transects in Cheshire and Wirral, the Stock Dove breeding population in the county in 2004-05 was 2,130 birds (870-3,390), an average of only just over four birds per tetrad in which they were found. Stock Doves may have several broods in a season lasting from February to September, although most activity is in June. Their nests are completely different from the rest of the pigeon family, in a large tree cavity, so they find themselves in competition with species including Tawny and Little Owls and Jackdaws. They readily take nest boxes and are in fact the commonest occupant of boxes erected for Barn Owls in the area of west Cheshire covered by the Broxton Barn Owl Group. Oak was the only species of nesting tree recorded during this Atlas. Observers proved breeding in less than one-third of tetrads, mostly by finding nests (123 tetrads), with recently fledged young reported in 20. Birds were found carrying sticks or visiting likely nest sites in a further 27 tetrads, these activities counting as probably breeding.